I wanted to take some time to point out a few small books from out 2012 Best Books list that are definitely worth noting. They are both slim, well designed, and delightfully odd – and also hard to forget. Most Popular of All Time isn’t exactly a photobook, but like the great History of Photography in Pen and Ink, renders well-known photographs in line drawings. The volume takes the form of a children’s activity book, though I wouldn’t exactly consider it a book for kids. 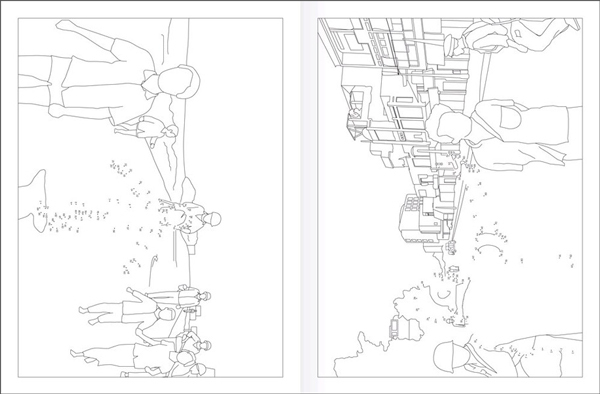 Reduced to its most vital edges, each image features a connect the dots portion (trace the outline of Neil Armstrong on the moon or Albert Einstein’s tongue – or in more grim demonstration, the falling figure in Richard Drew’s iconic September 11th photograph or the executioner in Andy Adam’s 1968 Siagon photo), but it’s also a coloring book. The images included aren’t a textbook selection of important photographs from the 20th century, but were complied by surveying a number of online lists of the most popular photographs of all time. All of these photographs will be familiar to just about anyone, regardless of their knowledge of photo history. The images are so hugely iconic, that those who recognize them in this simplified form will likely not be able to detach them from a myriad of associations, whether historical, cultural or personal. The book was created as an experimental collaboration between Gordon MacDonald and Clare Strand for Brighton Photo Fringe, of which MacDonald is trustee, and the activity pages were intended to be completed by the audience and hung as part of the exhibition. MacDonald and Strand describe their work as being “designed to encourage audience interrogation, promoting a reassessment of our relationship to photography.” I haven’t followed the numbers or colored in any of the pages, but simply viewing these images in this context, being forced to mentally fill in the blanks and feeling the texture of the paper made for crayons, was enough to make me look at and think about these images differently. I was immediately taken by Tiane Doan na Champassak’s The Father of Pop Dance and was glad to see it on two Best Books lists this year. The small spiral bound book features a sequence of studio photographs found by Champassak of his father dancing. Made in Los Angeles in 1967, the images are beautifully characteristic of the time period, featuring multiple exposures, colored lights and a lovely array of patterned trousers, splashy shirts and festive neckwear. The reason these images were taken is unknown, and there's no indication of what music Champassak's father was dancing to -- but none of this matters. The book is full of light, movement and song. Paging through, my mind always seems to find a tune to accompany the images. The Most Popular of All Time was selected as one of the Best Books of 2012 by Aaron Schuman. 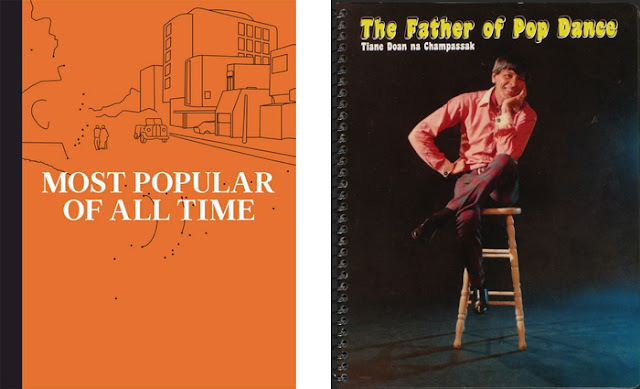 The Father of Pop Dance was selected as one of the Best Books of 2012 by Aaron Schuman and Rémi Faucheux.